In the ﬁnal article of this two-part feature on the assessment and management of childhood asthma, the authors explain how a ﬂexible approach to treatment will provide optimum disease control. Part 1, which focused on diagnosis, was published in the November/December issue of BJFM. The most important step in managing children with asthma is a clear and age-appropriate explanation about the diagnosis to children and their families, along with an understanding of how the families plan to balance management requirements against side effects and inconveniences of drug use. 2,6 It is important that side effects from use of pharmacological agents such as steroids are monitored if long term use is necessary. prevent severe exacerbations (and hospitalisations). Bronchodilators and steroid inhalers are the mainstay of asthma management in the majority of cases in the community. Younger children with predominant allergic symptoms (especially those under five years) for asthma exacerbation may benefit from a trial of montelukast therapy, instead of starting a steroid inhaler as the initial trial, and parents may accept this better. Escalation or stepping down of therapy should be guided by the response to treatment. However, a need for regular escalation of therapy or frequent exacerbations should lead to a review of the initial diagnosis, inhaler techniques and actual adherence to therapy. cleaning the spacer device with washing up liquid and hanging it up to dry (do not rub it as this will cause scraping of inner surface of spacer device and reduce future drug delivery). It is important to explain to the parents the difference between preventer and reliever medications. It is not uncommon for parents – and to a certain extent some clinicians – to remain unclear regarding the role of the therapies and use these interchangeably, leading to poor asthma control. 1,2,11 It is also important to give a clear written plan (if necessary in the parents’ mother tongue) as to what should be done in the event of an asthma exacerbation. The BTS/SIGN guidelines (www. sign.ac.uk/pdf/sign101.pdf) should be followed in management of asthma 3 and the reasons and rationale behind any deviation from these recommendations should be clearly documented in the medical notes. A detailed discussion regarding BTS/SIGN guidelines on asthma management is beyond the scope of this article, and readers should keep themselves updated regarding any amendments made to the recommendations. Salbutamol is the commonly used inhaled bronchodilator therapy in children. It is a short- acting ß-2 agonist, has a rapid onset of action (within five minutes) and usually provides 4–6 hours of bronchodilation. 6 It should be used as a reliever therapy and is in the first step of BTS/SIGN guidelines on asthma management. It is important that while reviewing a patient with asthma, the practitioner establishes how often the child needs the reliever therapy. Need for frequent bronchodilator therapy, especially for interval symptoms such as exercise intolerance or night coughs, may indicate escalation of therapy – i.e. initiation of step 2 of asthma management. Although it is not common practice to use bronchodilator therapy in oral (syrup) form in children, it may be necessary in some children who do not tolerate inhaled therapy. 3 Good oral hygiene will be all the more important for these children. Similarly, inhaled ipratromium bromide may be useful in some cases, especially during episodes of an asthma exacerbation. It is useful to use peak expiratory flow rate (PEFR) monitoring pre and post bronchodilator therapy (this can be generally achieved by children >5 years of age) to assess response to therapy. A 15% improvement is suggestive of airway reversibility in asthma. 3 Long acting ß agonists (LABA) can be important in the management of asthmatic symptoms. Inhaled steroid therapy is necessary where frequent exacerbations are seen or there is a need for regular bronchodilator therapies especially for interval symptoms. Beclometasone, usually the first line steroid inhaler, should be started at a low dose via a spacer device. The rationale for its usage as a preventer therapy should be explained to the parents in simple, plain terms. It is important that while considering a change of the type of steroids or inhaler device used (e.g. Turbohaler, Easyhaler), equivalent doses of inhaled steroids relative to beclometasone are given before the change is initiated (see www.sign.ac.uk/ pdf/sign101.pdf) 3 to avoid any inadvertent risk of overdosing with steroids. Any further escalation of regular asthma therapy should preferably be done in consultation with secondary care, especially in younger children. Guidelines recommend referral at step 4 or 5, but in practice, if a child does not “settle” with step 2 treatment, many primary care providers will choose to refer to secondary care for an opinion to establish the diagnosis of asthma and to rule out any other pathology. However, once these children are reviewed in secondary care and a clear management plan is drawn up, regular monitoring of asthma control can be undertaken in general practice with ongoing support from the secondary care services. We suggest that any decision to make available a stock supply of oral steroids for use by parents at home without a concurrent review by a medical professional for asthma exacerbation should be made by the secondary care paediatricians. 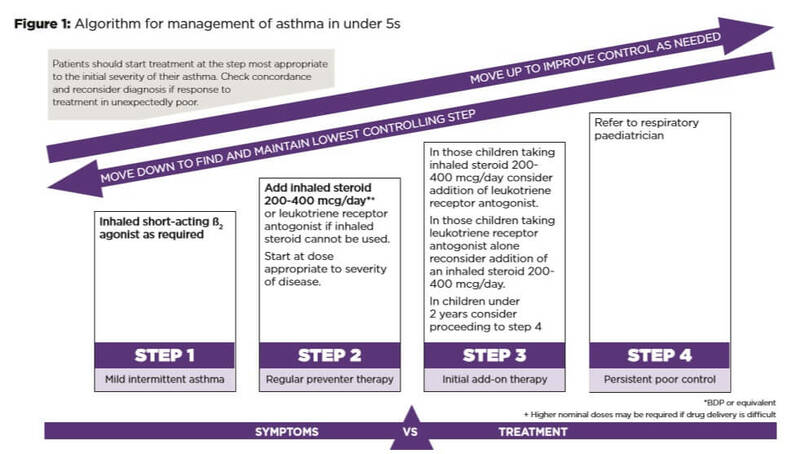 The BTS/SIGN guidelines on asthma management for children under five years and children aged 5-12 years are shown in Fig 1 and Fig 2 as a quick reference guide. Management of acute exacerbations Acute exacerbation of asthma often triggers a consultation with a health professional. The mainstay of management of acute exacerbation involves addressing the bronchospasm and ruling out infective causes during an acute episode. Mild to moderate exacerbations of asthma in children with oxygen saturations >94% in air and who are clinically well may be managed with regular bronchodilator therapy via a spacer device with up to 10 puffs of salbutamol pMDI as required. The need to use bronchodilators more often than 4-hourly should be considered as a sign of deterioration in clinical status and the child should be referred or parents advised to take the child to hospital. Specialist secondary care management is not within the realms of this article. However, as a general approach this involves stepwise escalation of therapy. This starts with regular use of inhaled bronchodilator therapy (sometimes as often as hourly) via a spacer device (even if the child normally does not use one at home). This may be escalated to regular nebulised bronchodilators and oral steroids.3 Children with severe or life-threatening asthma exacerbation may need intravenous bronchodilators (salbutamol and/or aminophylline) and intravenous steroids. Magnesium sulphate – which has demonstrated variable improvement in patients with severe airflow limitation who are unresponsive to standard treatment with beta agonist, anticholinergic, and corticosteroid medications – does have a role in some cases but should be used with support from intensive care. Asthma in children has long-term health implications. A flexible approach is necessary while managing asthma in primary care. Once a diagnosis of asthma is established, judicious use of therapeutic trials via a spacer device should enable successful management of most children in the community. An individualised written management plan should be given to the families, and monitoring should be carried out, preferably by asthma nurse specialist in general practice. 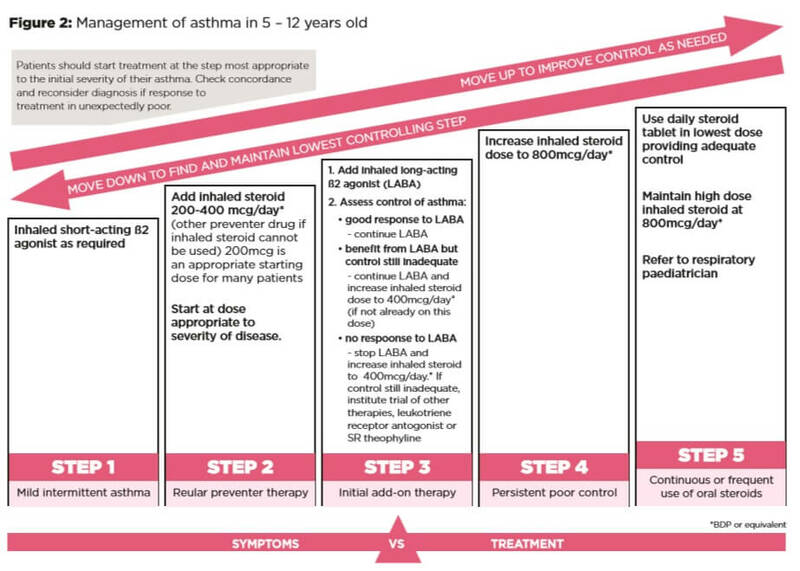 BTS/SIGN guidelines should be used for the management of asthma in a child. Education and support for parents are of utmost importance to improve the adherence to treatment of asthma in children. 1) Bush A. Prim Care Respir J. 2007;16(1):7-15. 2) Paul SP, O’Keeffe P, Sanjeevaiah MK, Brettle E. J Fam Health Care. 2012;22(5):16-20. 4) Backer V, Bornemann M, Knudsen D, Ommen H. Respir Med. 2012;106(5):635-41. 5) Kuethe M, Vaessen-Verberne A, Mulder P, et al. Prim Care Respir J. 2011 Mar;20(1):84-91. 11) Lavorini F, Fontana GA. Expert Opin Drug Deliv. 2009; 6(1):91–102.